Oh, Leslie Brenner. Where should we start with you? First of all, we’ll certainly miss you as you head off on your new endeavors and humbly congratulate you on the big move. An ex-food critic going to work on the other side of the same industry, no doubt for a considerable bump in salary. Hmm, okay. We all make certain choices in life and we fault you not for your apparent ambition. Unfortunately, your choice of throwing shade at NIWA Japanese BBQ based on a memorable visit (for us, at least) was probably one of the “less successful” choices of your career. You must’ve forgot. We’re in Deep Ellum, Dallas, Texas here. With deep Samurai roots in Japan. We’d love to tell you more about it, but that would require at least a minimal amount of mutual respect from the outset. So for now, we’ll just give you a sneak peak at what they meant when they cautioned about picking your battles wisely. So, let’s be honest about your visit to our house, which we warmly welcomed you into just as we do with anyone who walks through that heavy wooden door. As you’ll remember, you came in with two other guests under that creative pseudonym of yours. One of your underage accomplices proceeded to demand an alcoholic beverage. Without going into the more mundane or personal details, when we asked for a little time to do some due diligence regarding an interesting loophole in the law that we admittedly were unaware of at the time, his pushy attitude and entitled approach was, should we say, “less successful”? We’re not sure if that’s just your preferred modus operandi or if Dallas Morning News even knew about or condoned this kind of tactic or arrangement, but from our view, if you’re on the clock, perhaps you should focus on being professional. That is, focusing fully on the task at hand, without the unnecessary distractions, emotional, personal, or otherwise. In Japanese, we call that chuuto-hanpa, but as the ostensible voice on Japanese food, you’re surely aware of the concept already. Speaking of which, let’s delve a little deeper here. You refer in your half-review of Niwa Japanese BBQ to Tokyo Yakiniku restaurants that are more ambitious or varied. We’d love to know which ones you’re talking about and how you’re measuring that vague distinction. From your apparent lack of enthusiasm and understanding of Yakiniku we guess that’s just a lazy writing technique, but we’ll entertain the notion seriously since some people apparently still take your reviews seriously. We don’t purport to know everything, but again, we do have deep roots in Japan and understand the history, culture, and even general business zeitgeist pretty well. We welcome an open, cordial, well-intentioned discussion about this or that, anytime and anyplace. We always love to learn and we’re always glad to share what we know. Or perhaps Yakiniku just simply never was your cup of green tea to begin with? If so, please, let’s just be honest about that. There are plenty of things that every human doesn’t like or understand, and as fellow humans ourselves, we have deep respect for those who can take into honest account the vulnerability of admitting our lack of knowledge and/or idiosyncratic tastes. As your final goodbye, it seems you wanted to pay tribute once again to Tei-ichi. You seem to repeatedly know and love his food. You seem to have eaten there often. If you stay in this city, we surmise your fans will be able to find you there in the future. With all due respect and credit to Tei-ichi for what he (and you) have done, you do realize that there are other Japanese restaurants who have put a lot of time, effort, and love into their restaurants. We never sought your love, but we expected a bit more time and effort. Shortly after that article, you posted a glossary of terms. We understand you have deadlines and word limits, but please just respect the craft of the true food critic by at least getting the fundamental things right. Wagyu is not “a breed of beef known for rich marbling of its meat.” We won’t laugh but you have to understand that it is kind of funny for those of us who do this stuff for a living. 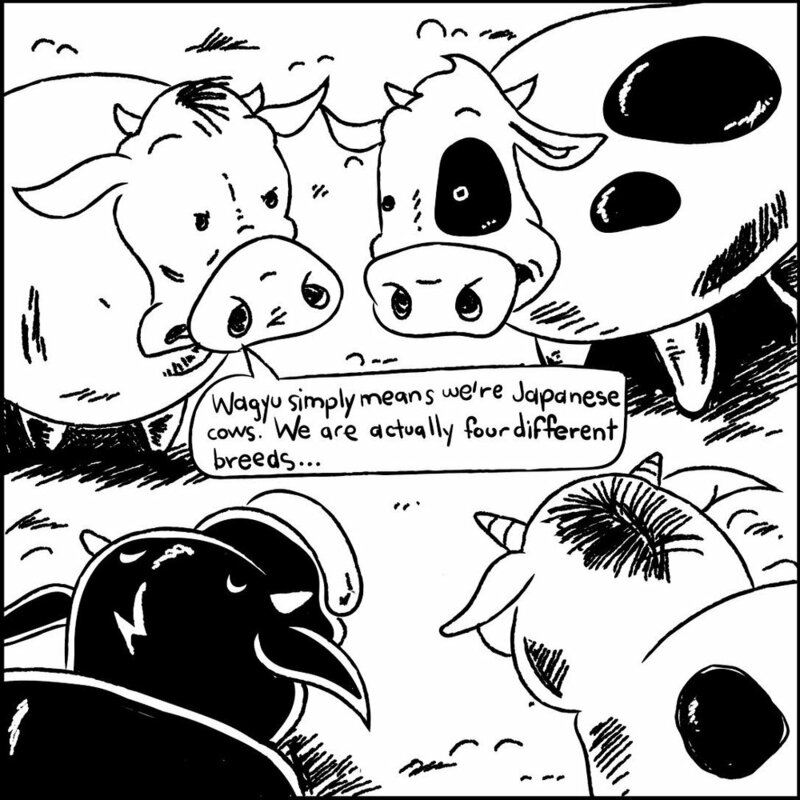 As you did consistently with other terms, the translation for wagyu is actually “Japanese cow” (wa = Japanese, gyu = cow, or by extension, beef). Technically and simply for now, there are 4 breeds. Wagyu, therefore, is not a breed. And what naturally follows from that foundation could be a really great dinner table discussion or published article that would be truly useful and educational for the interested consumer. But hey, why be accurate or get technical as a food critic when it isn’t absolutely necessary, right? Sunumono, is spelled sunomono, tseukemono is spelled tsukemono, but we see what you did there. Since it’s a glossary, you wanted to literally gloss over all the details… Nice! In conclusion, it’s all good. We here at Niwa Japanese BBQ are understanding folk and we certainly have no intention of holding grudges, though it is true that we have been known to specialize in having beef. Nice! You see what we did there? Come on, we’re just having a little fun with the puns, don’t you see? What else can we do? You came into our house under suspicious pretenses and motives so we’re just hopping into your house to play the critic for a hot minute, tossing around witty commentary and playful underhanded jabs in return, hopefully educating some of your readers along the way about what we found to be the “less successful” bits of your half-review. And to be completely frank, we took it easy and shall henceforth leave it at that. It’s all fair game, no? And who in Texas doesn’t appreciate a fair game? After all, you do realize that your words, with your wide audience, can end up having a significant impact on the livelihoods of the many people who work hard every day to make a complex operation run as smoothly as possible? From what we and many others know, some of your actual reviews already have affected the lives of others so this article in question and our response to it is all but a distraction from the bigger picture. You see, we don’t really have the same deadlines or word limits here, but we do have a real business to run, employees to manage, and both new and loyal customers who we aim to satisfy each and every night. We take all legitimate criticism or concerns seriously and always hope to learn and get better. It isn’t always easy to please everyone all the time, of course, but we will always try our best. So with that, we here at Niwa Japanese BBQ would like to take this delicious opportunity to warmly welcome you, our new and loyal customers alike, to our house in Deep Ellum, Dallas, Texas, to come see for yourself what a real, non-chain, Japanese BBQ restaurant looks like. Just like in the old samurai days of a mythical Japan, all high horses should kindly be left outside on Main Street or perhaps around the corner to be guarded by the big dragon mural that adorns our eastern flank. Leave all your troubles and worries outside and come on in to enjoy the food and drinks, the interior design, the sound system, our private dining rooms, the view of downtown Dallas from our fully-stocked bar or outside patio, and the overall festive Yakiniku experience with your family, friends, or even all alone like a true samurai. Come celebrate old departures, new arrivals, love, life, food, drink, words, conversations, beautiful experiences, and of course, our apps. There’s a story behind them and they trace back to childhood memories, real childhood memories of real Japanese people who grew up to understand and appreciate certain tastes. And as with all memories, as they age, they become infused, however subtle or strong, with the tastes and inspirations of new experiences and the complex emergent memories that result from these magical interactions. You might not like some or all of them, and it is our recommendation that you simply avoid ordering those the next time around. Or who knows, perhaps we’ll blow your mind on some or all of them, and it is our recommendation that you simply order as much of those as our kitchen and your bellies can handle for that night, or day, or every other time in between. We have full confidence that you will be the best judge of your own particular preferences and tastes. Leave the rest up to us for that is why we have put our time, effort, and love into bringing Niwa Japanese BBQ to fruition in the first place. There’s no way to know until you try and we’re confident that those who come in with an open heart and open mind will find something worth coming back for, even if it’s something that isn’t the same thing as what another person comes back for. And finally, as a sincere thank you and festive congratulations to anyone who is determined enough to get all the way down this far on our side of the story, we’re offering an unexpected treat, Deep Ellum-style. Now through September 2017, to celebrate the other half of the poignant Japanese concept of “chuuto-hanpa,” we are enthusiastically treating you to 50% off all of our apps. Moreover, we’re so confident that you’ll find appreciation in your hearts and bellies for them that you can call us out on any that you think can be fairly labeled as “less successful.” Just ask for the manager and tell them that you’d like to redeem your “Leslie Brenner” on any or all of those apps and we’ll gladly comp them for you. So with that, Irasshaimase, Kanpai, and please feel free to spread the good word!